BELIZE CITY, Fri. Jan. 22, 2016–Opposition Leader Francis Fonseca objected this morning to the reappointment of Lionel Arzu as Ombudsman, citing reports of “inactivity and ineffectiveness” in recent years. Fonseca spoke after Prime Minister Dean Barrow, United Democratic Party member for Queen’s Square, introduced a motion for Arzu’s reappointment for a year, effective January 1, 2016. 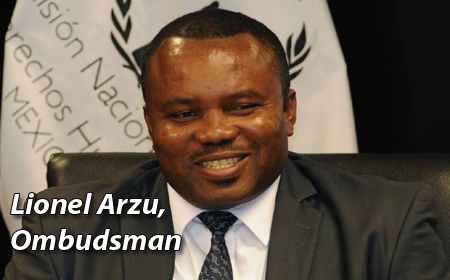 Arzu was first appointed back in January 2013, and Barrow said that he is eligible for reappointment and continues to possess the relevant qualifications. As a result, he asked Parliament to recommend him to the Governor-General for reappointment for a further year. However, Fonseca said that the motion is not one that the Opposition could support. “I wish to place on record that over the past few years that Lionel Arzu has served as Ombudsman, we have received and many of my colleagues have reported concerns about the level of inactivity and ineffectiveness…” Fonseca said. He added that this was furthermore reflected in the Ombudsman’s own reports. Fonseca said that the position taken by the Opposition “is not personal at all,” as he believes Arzu to be “a decent man,” but he went on to say that the sense of the Opposition is that Arzu does not enjoy as Ombudsman the level of trust and confidence that his two predecessors had enjoyed. “We believe that that office of ombudsman should be led by someone who is more strongly committed to defending and protecting the rights of Belizean citizens,” Fonseca commented. In reply, Barrow said that while he respects the view of the Opposition, he does not agree. “As far as we are able to determine, Mr. Arzu has discharged his duties vigorously and is well respected not only at a home, but abroad…,” Barrow said.